In 1957, the D'Oyly Carte Opera Company's monopoly on the British performing rights for the G&S operas still had four years to run. But, due to an odd gap in the copyright laws, anyone who wanted to record the operas was free to do so. 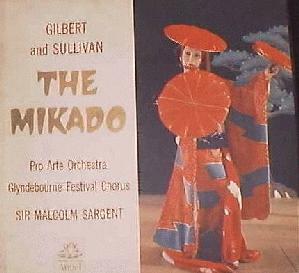 The introduction of the stereo LP in the mid-fifties apparently was the impetus for EMI and Sir Malcolm Sargent to launch their own series of G&S opera recordings in direct competition with D'Oyly Carte. In fact, Sargent managed to issue his first stereo recording about a year before D'Oyly Carte did so. Since the best G&S specialists were under contract to D'Oyly Carte, Sargent took the approach of recruiting singers from the world of grand opera. While these artists could not match the D'Oyly Carters' idiomatic feel for the material, it was Sargent's belief that they could make up for this with superior musical values. Whether the trade was an even one can be debated, but Sargent certainly deserves credit for recruiting a strong team and keeping it largely intact for the six years that it took for the series to be completed. 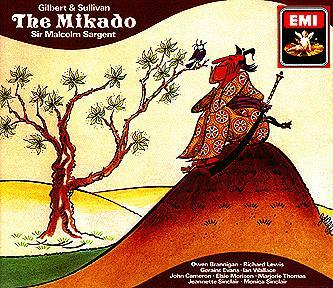 The entire series featured the Pro Arte Orchestra and the Glyndebourne Festival Chorus; thus, these are sometimes called the "Glyndebourne" recordings, even though they had no other association with the Festival. The Sargent recordings have never been out of the catalog for very long. They remained available as long as LPs were offered for sale and were re-issued on CD starting in 1987. I am no great fan of the Sargent recordings. 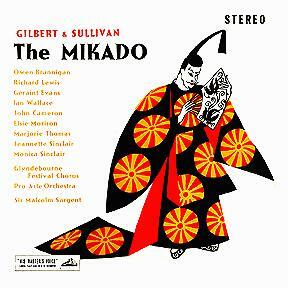 For an opera like The Mikado that has been capably recorded so many times, I find that this set offers very little. 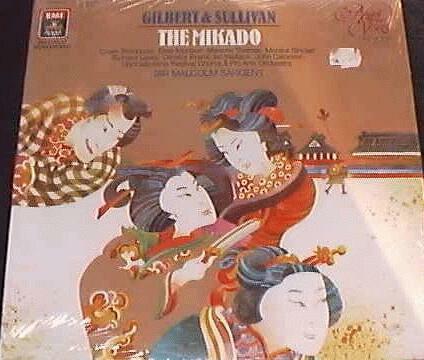 As an aside, this recording preserves the "n-----" word in Ko-Ko's little list song, but alters it in the Mikado's song. HMV Mono 45rpm 7ER 5174 One disc, labeled "Act 1 Excerpts"
1985 EMI/Angel Stereo LP AVB 34020 Digitally remastered. Jul. 1989 EMI Stereo LP EX7 49696-1 Also includes Trial and Gondoliers. 1998 HMV CD HMVD 5 73059 2 Slimline double sold in HMV shops exclusively.